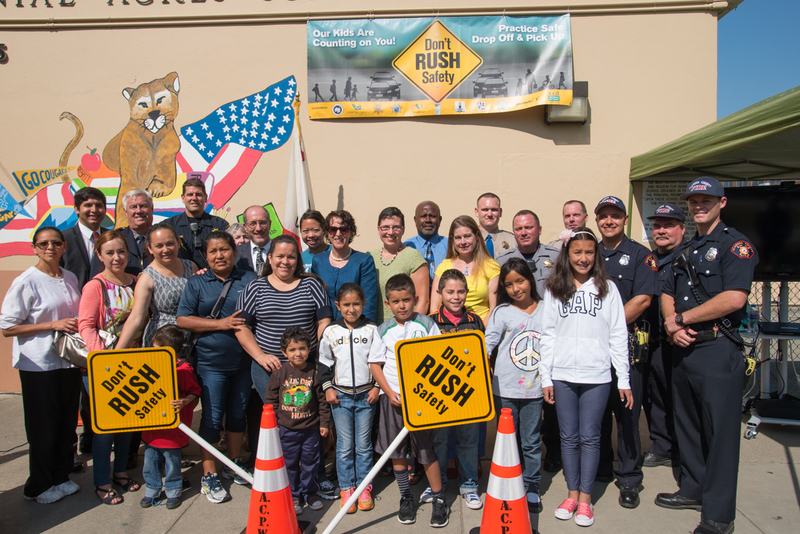 BikeWalkCV is proud to participate in the “Don’t Rush Safety” campaign that kicked off Tuesday with a press conference held in partnership with law enforcement, Alameda County, local school districts and BikeWalkCV. This campaign highlights the need for parents, students, and all members of the community to work together to slow down and pay attention, while driving, walking or riding a bike, particularly around school drop off and pick up times. I spoke at this event, telling my story of my and my son’s experiences getting hit by cars in Castro Valley. This drove me to co-found BikeWalkCV and seek out other community partners to work together to improve safety. This campaign is a huge step forward for students, pedestrians, bicyclists, and all Castro Valley residents. The campaign kick-off was reported in the media, including this ABC 7 News Report, a Report on KRON 4 News, this Castro Valley Patch article, as well as this Mercury News article that also references the public service announcement that was shown at the press conference.